It took 30 years before Hodges-Hite attempted to run again after her first husband, who was also her tennis partner, suffered a stroke. Unafraid to wear shorts, there was another roadblock: Only one other woman in town ran, and she was the subject of derision. In order not to be seen “in the same category as the ‘crazy lady who ran for fun’”, Hodges-Hite decided to run with a purpose: competing in races. She began training on her own – “I didn’t know anything about the right equipment. I ran in Converse shoes.” Alas, in 1980 she fell on the pavement and broke her hip. Seven weeks later, sprung from the body cast, she decided to train seriously. With a coach at her side and wearing proper footwear, Hodges-Hite ran six days a week, including Sunday mornings before church. She began winning races and the respect of her community. She ran her first marathon in 1983 at the age of 46, finishing in three hours and 52 minutes at the Hunter Air Force Base in Savannah, Georgia. 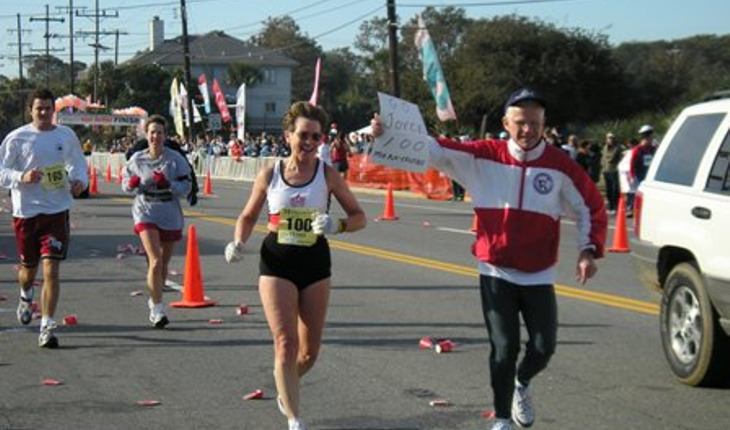 “I was very proud.” She did two minutes better at her next marathon in 1984. In 1988 she was “mad as spite” that she clocked in at four hours and 13 seconds at the TCS New York City Marathon. All thoughts of her running time evaporated a short time later because her husband died. Five years after their marriage, both retired from their jobs as schoolteachers and began running marathons together around the world from Scranton, Pennsylvania to Dubai. In August 2013, at age 79, Jim Hite came in fourth in his age group in a Duathlon (run-bike meet) in Ottawa. A month later, after a physical therapy session and his daily four-mile run, he died of heat stroke. Sherry Amatenstein, LCSW is a NYC-based therapist, speaker and author of four books, including How Does That Make You Feel? : Confessions from Both Sides of the Therapy Couch and The Complete Marriage Counselor: Relationship-Saving Advice from America’s Top 50-Plus Couples Therapists. Her website is www.marriedfaq.com.